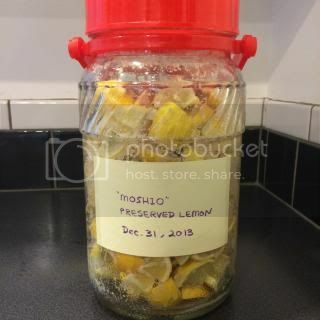 Ever since I made my first batch of "Moshio" (seaweed salt) preserved lemon, I've been crazy about it. 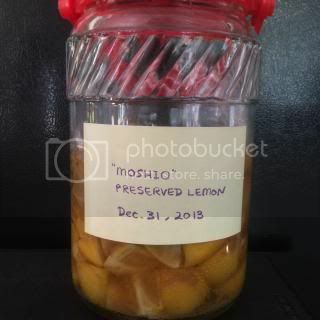 Here's how I make "moshio" preserved lemon. I finished my first batch so fast last year, so the end of last year, I made more to fit in a large jar. 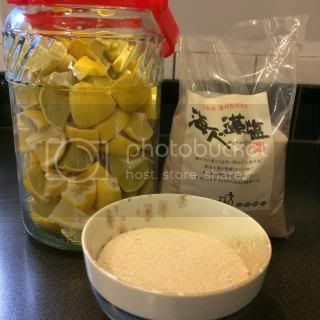 The preserved lemon becomes ready to use after 1 month. After over 6 months, the preserved lemon is at its beautiful stage. The lemons are very nicely fermented in salt and covered in salty syrup. It's like lemon marmalade with no sugar. I learned that preserved lemon should keep for a few years when stored at a dark and cool storage, but I'm sure I would finish this big jar much sooner. 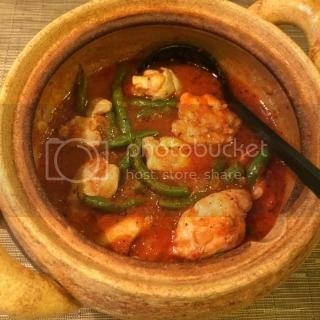 The other night, I made simple chicken and vegetables in preserved lemon and spice sauce in my tagine-style donabe, "Fukkura-san". I will post the recipe soon. Last night, I made another chicken dish with "moshio" preserved lemon. This dish is super easy and so delicious. It's the collaboration of two fermented seasonings. Both shio-koji and preserved lemon add such nice depth and flavors to this extremely simple dish. It cooks really nicely in soup & stew donabe, "Miso-shiru" Nabe. In a Ziploc bag, combine the chicken and shio-koji and mix well by hand. Tightly close (with the air out) and let the chicken marinade in refrigerator for at least a few hours to overnight. In Miso-shiru Nabe, sauté the onion and fennel seeds in 1 tablespoon olive oil over moderate heat until the onion is very soft (about 10 minutes). Add the garlic and sauté until aromatic. Turn up the heat to medium-high and add the sake and simmer for a couple of minutes. Add the crushed tomato, preserved lemon and syrup, bay leaf, and oregano. Cover. 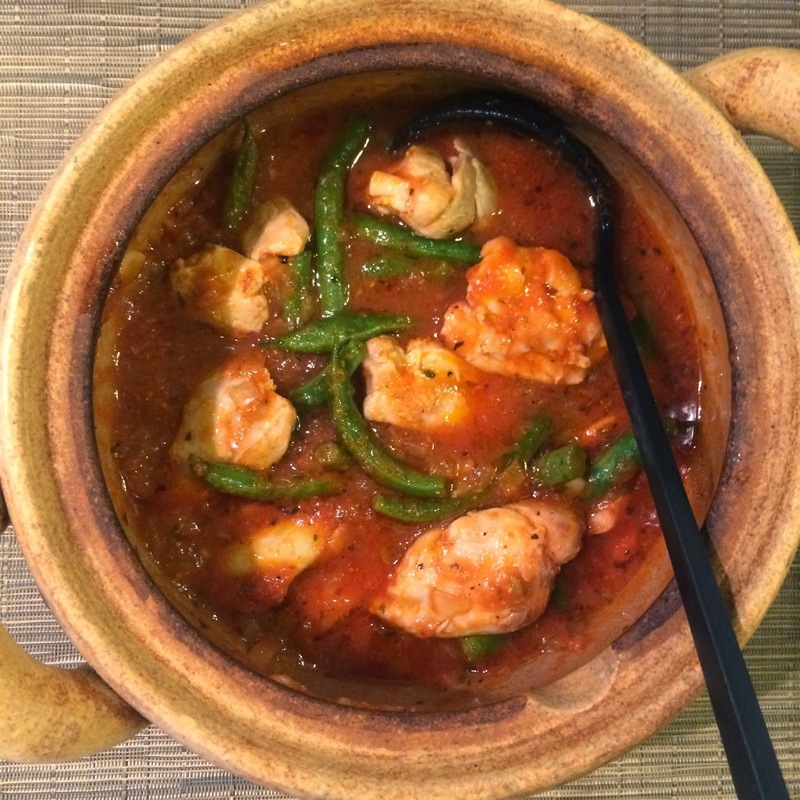 As soon as it starts boiling, turn down the heat to simmer. Meanwhile, in a sauté pan, pan-fry the chicken in 1 tablespoon olive oil over medium-high heat until lightly browned outside but not fully cooked to inside. 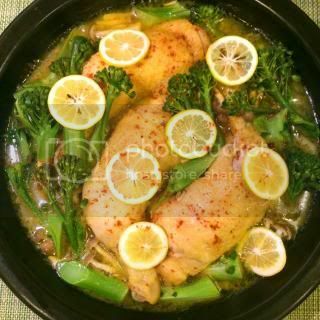 Transfer the chicken (but leave the oil in a pan) to Miso-shiru Nabe and simmer for 10 minutes. Clean the sauté pan after chicken was transferred. Heat 1 tablespoon olive oil and sauté the green beans over medium-high heat for about 2 minutes. Transfer the green beans to Miso-shiru Nabe (but leave the oil in a pan). Continue to simmer for additional 2-3 minutes. Add a pinch of pepper and adjust the seasoning with salt, if necessary. Turn off the heat and let it rest (with lid on) for 10 minutes. Serve into individual bowls at the table.